What are the primary market segments for Planned Gifts? How do you get to the Mass Market? What is wrong with traditional telemarketing methods? Legacy Leaders provides Telephone-Based Relationship Building, NOT Telemarketing. 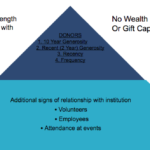 The Legacy Leaders Plan for Mass Market Planned Gift Fundraising Starts with Donor Compass™! Contact Legacy Leaders to Learn More!